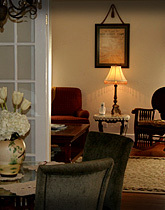 Located in an historic district adjacent to the Franklin Parish courthouse, the Jackson Street Guest House offers all the comforts of home and then some, and is a cut above anything else available in Franklin Parish. Guests will enjoy the privacy yet convenience of this century old home, which has been completely remodeled and updated with the most modern of conveniences, while keeping the charm of a turn-of-the-century cottage. 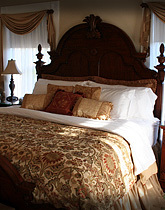 Accommodations described by guests as "simple luxury" greet visitors upon their arrival. The king size bed and whirlpool tub will make relaxing easy, and a full living room, dining area, and kitchen will make any guest feel right at home. 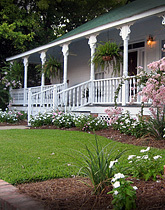 And, front porch rockers and the comfort of a cozy screened-in back porch offers yet more Southern charm in a private and quiet neighborhood setting. 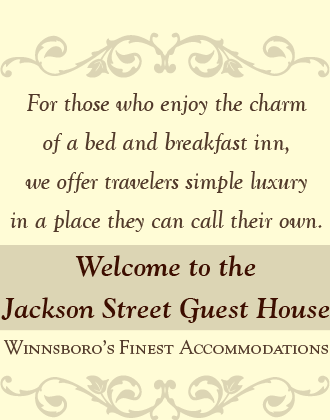 The Jackson Street Guest House is a great alternative during your stay in Winnsboro. Try it once. You'll be back.